Calling Dino Allsman and impersonating the IRS to find out where he works. Then on the next part of the tape we were pranking him and he was yelling at us. The quality probably the worse I’ve ever done. In some parts it blanks out completely. I’d forgotten I’d done the IRS call, but I guess that’s how I found out where he worked. Bit of audio from the TV shows Soap and then I Love Lucy. Not sure why I had these, but I might of had something to do with me recording and archiving TV commercials all the time. Wonder what happened to all my TV commercial tapes. 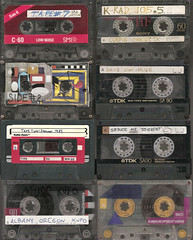 I bet there’s still plenty of old audio tapes at my parents house that used to belong to me. Oh yeah, the theme song from the Ewoks Saturday morning cartoon was in there too. Red box tones. My original red boxing tape that was made from recording the tones from a pay phone. So much toll fraud was committed with that tape. All the radio station IDs in between songs from radio stations in a lot of the cities I’d lived in. Those were interesting to hear. I recorded a lot of them while driving in my car – I’d cut out a giant chunk of my dashboard in the early 90’s and installed a dual-cassette deck stereo into it. The kind of stereo that belongs in a house. It worked great too. Any time I liked a song I heard while I was driving, I just hit the record button. Also entertaining were the DJs introducing some of the horrible music from the 80’s and 90’s. Internet parody songs – at some point in the late 90’s I decided that it’d be a good idea to transfer a bunch of the internet parody songs that I’d collected onto cassette tape. Because, you know, the internet is just a fad and cassette tape is forever! I guess the reason was because I was running out of hard drive space and didn’t have a CD burner at the time. Me and Sara (girl next door) playing Double Dribble on my NES and talking about things like Geraldo’s nose getting broken on TV, messing with people on the CB radio, prank calling the dean of boys, “did you record Freddy’s Nightmares on TV?”, putting Ozzy Osbourne’s picture on a dart board, Randee of the Redwoods for president. Talking to El Jefe on the phone, prank calling Mr. Hack and lots of other random places. I entered in a lot of stolen credit card numbers throughout it all to make the calls. Guess I should throw that tape away instead of giving it to Goodwill. Me prank calling some car lot in Albany. I yelled at some guy named Bernie and I have no idea who he is or why I was pranking him. Yeah, I know I said this is the non-prank call stuff and it is! Sort of. None of it was labeled as being prank calls. 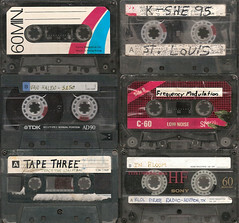 Most of the tapes weren’t labeled at all. My brother practicing his saxophone. Me listening to “I Just Called To Say I Love You” and playing along with it on my electric piano. Quite a few long stretches of silence, but in the background you’d occasionally hear people in my family talking or things crashing around. Me and Tracy (some girl from work at Eastgate Cinema) copying Def Leppard tapes using high speed dubbing. Geez, remember high speed dubbing?? House music from Eastgate Cinema. All the hits from artists like Lionel Richie, etc. For some reason I stole their muzak tape. Me prank calling What’s Your Bid in the 80’s and then a bunch of other radio shows. The What’s Your Bid stuff is pretty rapid – we probably got about 15 calls in there. On some other radio show I asked the host “What if C.A.T. really spelled dog?” On another I said I was a telephone-to-telephone salesman and tried to offer him something for free before he hung up on me and called me strange. A lot of stuff between me and this girl I used to babysit in 1986 named Christy. A lot of us is drowned out by loud music (we were dancing to Power of Love and the Neutron Dance), but in one part we’re using my TRS-80 and its speech card to input data to make prank calls to Dominos Pizza. I’d written a program that said all the important pizza-ordering phrases once you put in your name, address and phone number. Me and Sara (girl next door again) walking all over our block, talking about our parents and the neighbors, telling jokes and singing songs loudly. A few times we saw cop cars and yelled “COPS!” and ran. We used to get chased by them all the time, just for running. There was plenty of random weird stuff too. Like some live play that was recorded. A few tapes of church music and concerts. I’m sure some of my parents old stuff got mixed in there with mine. There was a tape of 1920’s-sounding music which wasn’t mine but I liked it so I converted it. Now all I’ve got left to do is my prank call tapes. There’s about 20 of them. Instead of giving them to Goodwill, I think I’m going to start up a new PLA contest for somebody to win all my prank tapes and CDs. Assuming that somebody will actually want a bunch of prank call audio tapes. I WILL WIN THE CONTEST. I hopefully won’t need to win, I’ll just ask RBCP REALLY nicely for some random tape he would just throw out anyway.